YAKIMA, Washington, December 23, 2010 (ENS) – Parties responsible for contamination at the Moses Lake Wellfield Superfund Site have reached a settlement that provides the $58.2 million in funding necessary to clean up the site. 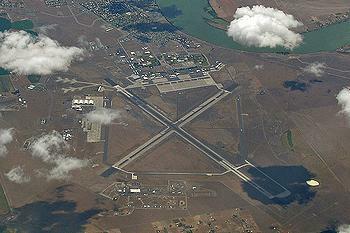 The site includes the Grant County Airport and the former Larson Air Force Base. Groundwater and soils at the site were contaminated with trichloroethylene, TCE, and other hazardous substances by operations of the former base and industrial activities associated with the aircraft industry. About 1,000 acres of groundwater are contaminated with TCE and there are several contaminated soil waste areas scattered across the site. Cleanup of trichloroethylene, an industrial solvent, and other contaminants was begun by the U.S. Army Corps of Engineers and will be completed by the U.S. Environmental Protection Agency. Under the consent decree lodged today in federal district court in Yakima, Washington, the federal government has pledged to provide an estimated $55 million in cleanup funds. Other cleanup funding, in the amount of $3.25 million, will be provided by The Boeing Company, Lockheed Martin and the City of Moses Lake. “This settlement will ensure the cleanup of TCE from groundwater at the Moses Lake Superfund Site.” said Ignacia Moreno, assistant attorney general for the Justice Department’s Environment and Natural Resources Division. “The Justice Department expects those responsible for pollution to pay for cleanup. This settlement shows the federal government’s willingness to live up to that standard when it is responsible for pollution,” she said. The settlement will fund the cleanup actions selected by EPA in September 2008. One soil site will be completely removed, because the contamination there exceeds safety levels. For two of the five known plumes of trichloroethylene groundwater contamination, the EPA decided that a groundwater pump and treat system will be installed to remove TCE from the groundwater until the drinking water standard of five micrograms per liter is met. “EPA’s cleanup will ensure that residents in and around the city of Moses Lake are protected from contaminants in the groundwater,” said Dan Opalski, director of EPA’s Office of Environmental Cleanup for Washington, Oregon, Idaho and Alaska. The settlement resolves a lawsuit brought by the City of Moses Lake as well as potential lawsuits by the federal government and the State of Washington. “We are pleased to be part of this agreement, and we look forward to working with EPA to clean up groundwater on this site,” said Jim Pendowski, the Washington Department of Ecology’s Toxics Cleanup Program manager. The consent decree, lodged in the U.S. District Court for the Eastern District of Washington, is subject to a 30-day public comment period and approval by the federal court.